It is one thing to “have” missionaries on your bulletin board at church. It is quite another to “support them” in a way that is consistent with what the Bible teaches. John instructs the church in his third letter to support them “in all your efforts,” and that missionaries should be sent on “their journey in a manner worthy of God.” Why? Because these “have gone out for the sake of the name.” They have left behind family and friends and comfort and security and moved, in some cases, to a place where they will face trials and suffering and sometimes even death. Not for their name’s sake, but for His. With prayer. John Bunyan said, “You can do more than pray after you’ve prayed, but you cannot do more than pray until you have prayed.” We are to pray first and most of all. Jesus said, “You did not choose me, but I chose you and appointed you that you should go and bear fruit and that your fruit should abide, so that whatever you ask the Father in my name, he may give it to you.” The promise to give us whatever we ask is in the context of mission. As we go and bear fruit in the mission he has given us, we can pray with confidence. That means we can and should pray with boldness for the missionaries we support, that God would protect them and provide for them. But even more importantly, we must pray that God will use them for the sake of his name. With financial support. We support a family of nine we sent to Bocachica, Colombia. Let me share one of their recent prayer requests about living on an island where there is a daily struggle to have clean drinking water. We have dug a second well. We hit sweet water, however, it only gives 20 gallons (per day) ... for a family of 9 it’s nowhere near enough. The problem is we don’t at this time think we should put more money into this well. It may be that we need to look for another owner who will let us use their land to put another well on. However in the area we need it ... the owner is hungry for money. So without buying land, which we can’t do at this time, we are back to square one. 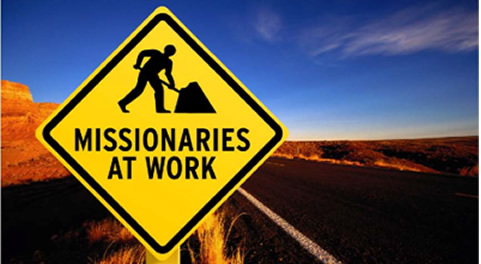 Hudson Taylor said, “God’s work done in God’s way will never lack God’s supply.” The missionary’s job is to make sure he is doing God’s work in God’s way. But where does “God’s supply” come from? Most often, it comes from God’s people. We must make sure that we are doing our part to supply the needs of the missionaries we support. With prayer, practical help, and finances.